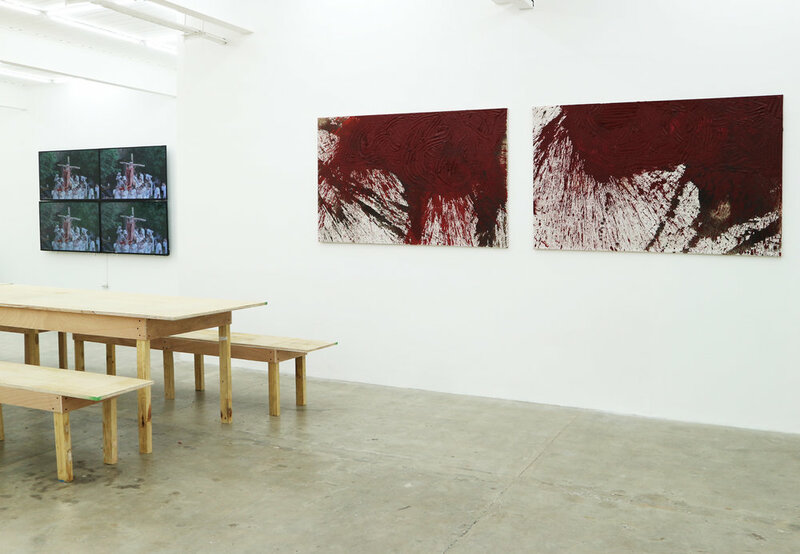 1335MABINI is proud to present a solo exhibition by world-famous and controversial performance artist Hermann Nitsch (1938, Vienna, Austria; nitsch.org). The artist is showing his works for the very first time in Southeast Asia. Nitsch recently celebrated his 80th birthday at his castle in Prinzendorf in Lower Austria. Nitsch is one of the initiators of the confrontational Wiener Aktionismus (‘Viennese Actionism’), shunning the confines of traditional painting and sculpture, reinventing an art that exists in real, corporeal terms through long-durational performances called actions, during which audiences are not mere spectators but actual participants – participating in a celebration of life and of being placed in this world. The goal of such celebration is to experience life, to intoxicate being and to enter a mystic ecstatic condition. Nitsch’s poetic, dramatic performances are titled Das Orgien Mysterien Theater (‘The orgies Mysteries Theatre’). He started performing The orgies Mysteries Theatre in 1957. This multi-day orgiastic festival is still performed today in Hermann Nitsch’s castle in Lower Austria, where its visitors become participants of the spectacle – so the audience is transformed and becomes part of the artist’s Gesamtkunstwerk, i.e. art and everyday life completely merge. To experience the drama – and for the drama to be expanded to a celebration of life – not only sight but also the senses of taste and smell are called upon. The sensual body experience is converted to the center of artistic activity for all attendees. Animals are slaughtered and eviscerated, the animals’ blood is consumed during the drama, captured and used in the artistic process as the spectacle progresses. The orgiastic staging is accompanied by a concert – the music is composed by Hermann Nitsch – and food and wine are served. For Nitsch, life is joy, it is celebration, exuberance and extravagance. Life – being placed in the world – is full of fertile ecstasy. Through his work, Nitsch seeks catharsis through compassion and agony. The bloody and orgiastic performances of the Viennese artist may seem disturbing at first sight, but the intention is to lead the visitors from the initial disgust to ecstasy – a life-affirming catharsis through all the senses. For his solo exhibition at 1335MABINI, Nitsch shows works he created between 1987 and 2010. Nitsch's paintings can be understood as a relic of his ritual, religious processions and highly choreographed performances manifesting an outbreak of the norm and celebrating life in all its facets. Significant in Nitsch’s oeuvre is the dominance of the color red – red as the color of flesh and blood, as a symbol of ecstasy, the Passion of Christ and sacrificial slaughter. In this sense, Nitsch’s art forms an emotional brand experience of despondency through provocation, it is a new myth about the total experience of existence.